Maybe you have some questions about clear braces, like how does Invisalign work? And what’s the difference between Invisalign and traditional braces? Or perhaps you’d just like to know if you’re a good candidate for the Invisalign system. 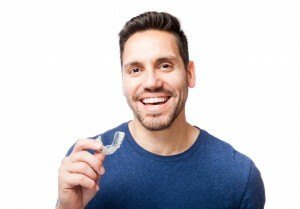 Dr. Jorgenson has the answers on your Costa Mesa Invisalign treatment. The Invisalign system works using clear aligners that place focused pressure on different parts of your teeth throughout treatment. You wear each aligner for two weeks before advancing to the next in the series. The Invisalign treatment is largely self-directed, with periodic visits to the dentist to ensure everything is progressing as it should. The average Invisalign treatment time is one year. Adults and older teens who wish for a subtle orthodontic solution agree: Invisalign is the clear choice. You’d like to benefit from clear braces, but is it really a good choice for improving the alignment of your unique teeth? Chances are good that you’re an ideal candidate for the Invisalign treatment. The system corrects the most common orthodontic issues, including crowded and gapped teeth as well as underbite, overbite, or crossbite. Patients should be in good tooth and gum health before undergoing orthodontic treatment. Don’t miss out on Advanced Dental Care’s $500 off Invisalign! Clear braces are more affordable than ever in Costa Mesa. Please get in touch with us to discuss your Invisalign treatment today.